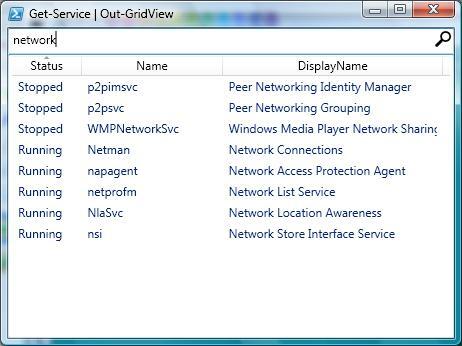 The information in this article was written against the Community Technology Preview (CTP) of Windows PowerShell 2.0. This information is subject to change in future releases of Windows PowerShell 2.0. The Windows PowerShell console window has, as the saying goes, a face only a mother could love. (And even Mom seems a little equivocal about the whole thing.) The command window is great for entering data, and perfectly fine for displaying small chunks of data. However, the moment you have multiple columns of data, and/or several hundred lines of data, well, at that point the console window begins to show its limitations. Limitations, you say? What kind of limitations? Well for starters, the console window uses non-proportionally spaced fonts (that is, the lowercase i takes up exactly the same amount of screen real estate as the uppercase M). That makes it difficult to display very much information across the width of the window. Likewise, buffer size limitations can limit the total number of lines of information that you can display. Suppose you run a script that returns 300 lines of output. Depending on your settings, you might be able to see only the last 200 of those lines. What happened to the first 100 lines? Well, those first 100 lines have gone to wherever information goes after being squeezed out of the console window buffer. In addition, there’s the fact that all the data in the console window is static. Would you like to sort the data in a different way? No problem; just change your command or script and re-run the whole thing. Would you like to search the output for a keyword? No problem; copy the entire output, paste it into Microsoft Word, then use Word’s Find command. Would you like to – well, you get the idea. The console window is OK, but what would really be useful would be an alternate venue for displaying data. You know, like maybe a Microsoft Excel-like grid or something. Boy, that would be nice, wouldn’t it? Well, guess what? 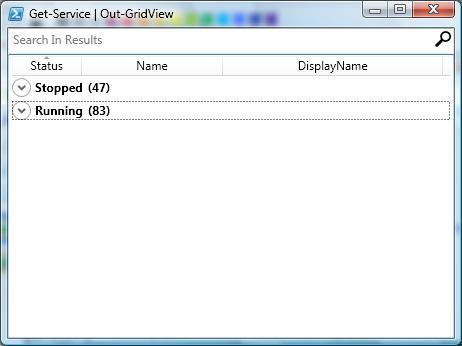 As it turns out, you aren’t the only one who’d like to be able to display data in a grid. 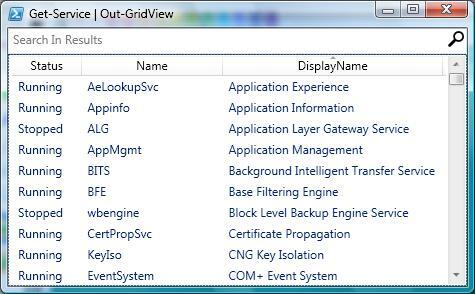 If nothing else, the Windows PowerShell team apparently had the exact same idea, which explains why the November, 2007 CTP release of Windows PowerShell 2.0 includes a new cmdlet named Out-GridView. 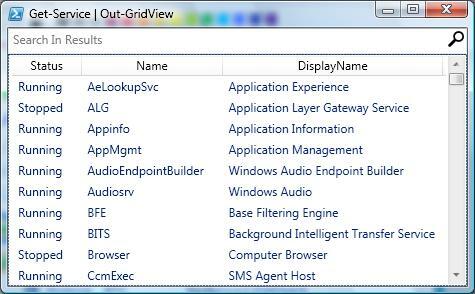 What does the Out-GridView cmdlet do? We had a feeling you were going to ask that. Important. 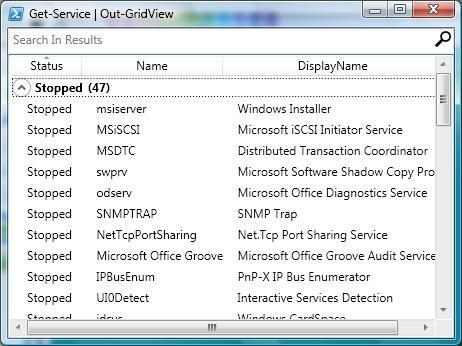 The Out-GridView cmdlet is automatically installed when you install PowerShell 2.0; however, the cmdlet won’t do anything unless you also have .NET Framework 3.0 installed. If you’re running Windows Vista then you already have .NET Framework 3.0 installed; if you’re not running Windows Vista then you can go to this page for more information. Oh, and if you aren’t sure which version of the .NET Framework you have installed on your computer, well, don’t worry about it: we’ve already written a script that can help you figure that out. So What Doesthe Out-GridView Cmdlet Do? 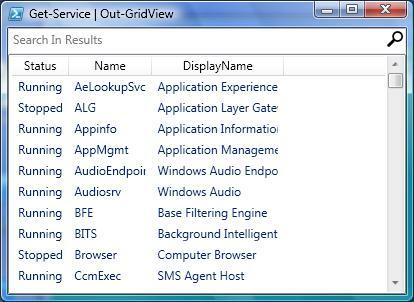 Ah, now we see: it’s the AudioEndpointBuilder service. That’s much better. Resizable columns; these might not get as much publicity as new PowerShell features like remoting and runspaces, but they just might be every bit as useful. Let’s try something else. By default, the Get-Service cmdlet sorts service information on the Name property. 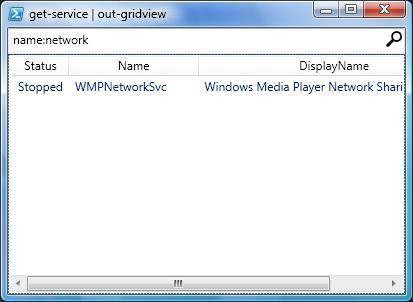 That’s fine, but suppose that what we really want to do is sort the service information by the DisplayName property. Again, that’s not a big deal; after all, we could just re-run our Get-Service command, taking care to sort the data by DisplayName before handing it off to Out-GridView. Should you someday tire of viewing information by group, well, all you have to do is right-click and select (Toggle) Show in Groups a second time. As the word Toggle suggests, this will now turn grouping off. To turn grouping back on, right click and select (Toggle) Show in Groups a third time. To turn it off – well, we could sit here and toggle grouping on and off all day. But we still have a few more features to cover. To clear the filtering, just delete the information in the Search box and press ENTER. Big deal, you say? You wanted the best of both worlds: data displayed in a gird and data that could be saved for later use. Instead, all you got was the data saved as an XML file; you didn’t get a grid at all. So what will you get when you run that command? Well, we hate to spoil the surprise. But give it a try; for once, at least, your surprise should be a very pleasant one.